Roland Garros 2011, US Open 2011 & 2012, Australian Open 2014, Wimbledon 2014 - my Career Slam as a tennis fan is now officially complete! My trip to Wimbledon started back in February, when I got an email telling me I won the famous Ballot, and had a chance to buy two tickets to the 2014 Wimbledon Ladies Semifinal day on Centre Court. After a few days of hesitation (London is not cheap), I decided that this might be a once in a lifetime chance, and bought the tickets. The rest of the trip was built around that. The problem with going to Wimbledon, as opposed to all the other slams, is the inability to plan much in advance. Other than the ballot tickets (where you also don't have the choice of which or how many tickets you get), you have to either queue to get in - sometimes for long periods - or be one of the lucky few who manage to buy online tickets the day before. In all other slams, it is much easier to buy multiple tickets both in advance and on short notice, not to mention ground passes which are often readily available on the day of play (with a possible exception of the French Open, where I didn't try to get a grounds pass). This system is undoubtedly very frustrating - you can't really plan anything in advance, and you heavily depend on the level of attraction of a particular order of play, which determines the size of the queue on each day. On the other hand, you can buy tickets according to the players you actually want to see, and don't need to guess well in advance which tickets to get in order to watch your favourites play. Those two feelings - frustration and flexibility - stayed with me throughout my London vacation. I traveled with my brother, who's 14, and we got incredibly lucky at first - on the day of our flight, we managed to buy Court 3 tickets on Ticketmaster for each of the next two days. This was a tremendous relief, as we were assured two consecutive days of play (Thursday and Friday) with no queuing during the first week. In addition to that, we queued for a grounds pass on "Manic Monday", which was less manic than usual due to schedule delays caused by the Saturday rains, and then queued from Tuesday noon for Wednesday's quarterfinals. This was also easier than expected, since the scheduling changes still dragged on, and both Tuesday and Wednesday featured a mix of men's and women's matches instead of the regular separation of quarterfinal days by gender. So, how does Wimbledon stack up against the other slams? To tell you the truth, at first the comparison wasn't favorable. You get the feeling that you're queuing all day just to queue some more after that - to get into the grounds, for a court, for a place to sit, for anything really. On second Monday, for example, we started queuing at 7am, got into the grounds around 11:30, had to wait for a long time until we could get two seats on court 18 (the grounds open at 10:30, and all the available seats on the outside courts get taken very quickly), and then... it started raining. So we waited out the rain on the court, because there's no way we're giving up our seats, right? Of course, right. By the time the sun came out (cue a cheering crowd), we were so hungry that we watched for maybe another 45 minutes before leaving our cherished seats to get some food. Then we waited for a while around the practice courts, which was when our patience was finally rewarded, as my brother got an autograph and a photo with one, Mr. Roger Federer. Around 5pm we joined the resale queue, and stayed there for two more hours of waiting, during which rain confined all play to the Centre Court. As soon as Murray beat Anderson, the queue started moving and we were able to get ourselves resale tickets for Centre Court and watch the last two sets of Djokovic - Tsonga. To sum it up - this day was long and tiring, but you get rewarded for waiting a lot. The reward for waiting became even clearer during the next couple of days. We joined the queue on Tuesday, hoping for a Wednesday schedule that would put both Rafael Nadal and Novak Djokovic on Court 1. We survived the full queuing experience, with a tent and sleeping bags and all, and were cranky and sleepy on Wednesday morning - both because we had a cold and slightly sleepless night (mostly cold), and because my brother was very disappointed to miss Nadal, who lost to Nick Kyrgios the day before. As my brother's other goal was to get as close as possible to the players (and hopefully catch a little souvenir when matches end), imagine our excitement when we realized that we could choose the seats closest to the players' entrance on Court 1. After getting our tickets, we spent our first hour on the grounds near the practice courts, where my my brother received a signed wristband from none other than Novak Djokovic himself. When we finally got to Court 1, it turned out that our seats weren't exactly near the players' entrance - but rather, front row, directly behind one of the players' chairs. Specifically, Djokovic's chair during his match with Cilic. 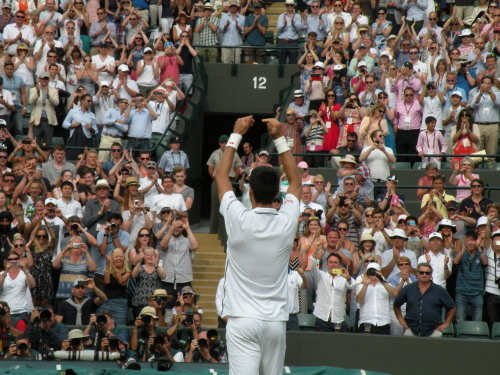 During the 5 sets that followed, we were Novak's personal cheering squad. I'll talk more about the Wimbledon crowd and their cheering habits later, but I think it would be fair to say that we were the ones who cheered the most and loudest, especially when he was close to us. We couldn't be sure if he heard us, or if he did - whether he knew where the cheers were coming from, yet we persisted. Thankfully, from two sets to one down, Novak changed his slippery shoes and generally started to play better, and finally won the match. After celebrating his win, and as he came to his chair, we tried to call him - but as it turned out, it wasn't necessary. Novak took his (clean) towel, sought us out, and threw the towel straight into my brother's arms. He then picked up his faulty shoes, threw one of them to us and another to another fan behind us, and proceeded to the exit and to sign dozens of autographs. There was no doubt at all that he heard our cheers and appreciated them, and made sure to personally thank us in this small way. Now, the Wimbledon crowd... is a weird thing. They're so overly polite, that it becomes ridiculous. I get clapping politely for both players (at any match, I'm not being specific here). I get not interrupting the players, this is great behaviour. I even get not cheering on errors, even though from my experience - that's a bizarre reaction from a tennis crowd. Occasionally, there'd be a good rally, but if it ended on an unforced error, maybe two people in the whole stadium clapped, one of them being the player's coach. When you're actually cheering for a specific player, you start feeling bad for cheering on him after winning such a rally... Anyway, what I don't get at all is only really cheering for a player when he's deep into the third set and the match might be getting to its end. Where were you earlier? A perfect example of this was the Cilic-Berdych match, for which we were lucky to have front row seats. For two and a half sets, the crowd politely clapped for any decent point, and stayed quiet on errors. There were small groups of Czech and Croat supporters who made a bit more noise on the more crucial points. But the crowd, as a whole, only got into it deep into the third set, as the sky was getting darker to the point of Hawk Eye not being able to function. On a side note, the crowd never realized that the players can't use Hawk Eye anymore, and kept urging Berdych to challenge the calls he was unhappy about. On the whole, though, this match - which was really of great quality from start to finish - completely lacked in atmosphere until it was too late to matter. While I appreciate a well-behaved crowd, it does dampen the mood when you feel you can't even properly cheer on a player, because you would be one of a select few who do it. A similar effect of an overly-polite crowd is seen around the practice courts. While we can't complain about it at all (since we benefited from it), it's a bit funny how those who wait for an autograph hardly try to call the players or do anything other than get their ticket, ball or program autographed. My brother was almost the only one who asked the players for a photo, and this is also how he got Djokovic's wristband and Federer's bandana, both signed by the players. The large majority of players go by unrecognized - I was literally the only one who tried to call Andrea Petkovic to come over ("after practice," she said), and I don't think anyone recognized players such as Kristina Mladenovic, Max Mirnyi or even Martina Hingis. They did recognize him, though. Despite what might seems as a post full of complaints, we had a great time in Wimbledon. While the constant queuing was tiring, the site has great courts, with excellent seats all over the place (especially if you're willing to wait for them). The resale system is a fantastic idea, letting people buy returned tickets for the big show courts at a silly price which goes to charity, and enabling ground pass holders making the most out of their day at the venue. All the queues are incredibly well organized, there are a lot of helpful stewards around and the facilities are convenient. Additionally, and this might seem like a minor point, but I think the Wimbledon food courts are the best among the four Grand Slams. Finally, and this is perhaps the most important thing of all - the tournament has great champions! Check out the blog's Facebook page for more photos from the different matches we've seen in The 2014 Championships. My apologies is this post seems somewhat disjointed, I've written it over a few days while plagued by a nasty ear inflammation which made it hard to focus on anything.